If this were a month ago, Isaiah Davis-Allen would barely have a second to talk. Before graduating with a degree in geographic information systems earlier this month, the Maryland lacrosse star had a schedule as packed as the man living 10 miles away on Pennsylvania Avenue. He’d awake around 6 or 7 a.m. to make a 7:30 team lift, then between 9:30 and about 2 p.m. he’d have three classes, barely fitting in time to eat. “I usually have to plan out my meals,” he said. After class, he’d rush over to the athletic buildings for film study and full-length practices that would last until 6 p.m. For most student-athletes, the remaining six or seven hours of the day — or, let’s be honest about college students, the next nine or 10 — would be spent eating dinner, catching up on television or Netflix and, you know, studying. But Davis-Allen, 22, would have one more item to check off his daily to-do list before he could even think about resting his head on a pillow: He had to go coach some teenagers. Davis-Allen coaches and mentors boys of color, ages 8 to 18, in lacrosse across the “DMV”: Washington, D.C., Maryland and Virginia. In a rematch of the 2015 national championship game, Maryland will play Denver at 2:30 p.m. Saturday in Foxborough, Massachusetts, in the NCAA Division I semifinals. The Terrapins lost to North Carolina in last season’s title game. Davis-Allen has been captain for the past two seasons and has helped lead Maryland to a 59-14 record, 17-3 in conference, over the past four seasons. He is the school’s first repeat All-American on the first team since 2006. He’s been named to the All-Big Ten team two seasons in a row and was announced as the lacrosse winner of the NCAA’s prestigious Senior CLASS Award, honoring the most outstanding student-athletes in the country, on May 25. The Major League Lacrosse (MLL) collegiate draft on May 28, a day after the NCAA tournament semifinals, will probably end with Davis-Allen being selected by one of the league’s nine teams. Multiple mock drafts have him going early in the second round. But Davis-Allen hasn’t thought much about his professional future. “My main focus has been on trying to win a national championship, so I haven’t really thought too much about it,” said Davis-Allen, who hails from Springfield, Virginia. He’s most concerned about his team finally getting over the championship hump this weekend after coming up short the past two seasons. Fittingly, they will be at Gillette Stadium — home of the defending Super Bowl champion New England Patriots. He’s also thinking about the almost two dozen kids in the DMV watching his every move. Since Davis-Allen was a student at the private St. Stephen’s & St. Agnes prep high school in Northern Virginia, he’s coached and mentored boys of color. He’s split his time between two Prince George’s County recreational and club teams, PG Pride and Prince George’s Lacrosse Club, as well as a Virginia-based lacrosse camp, Blackwolf. He has also volunteered with local Prince George’s high schools, which added varsity-level lacrosse for the first time in 2016, and the Springfield South County Youth Club, which he was a member of as a child. Davis-Allen, who’s played lacrosse since he was in the seventh grade, understands that having a stern and loving coach can positively mold an impressionable kid playing sports. North Carolina Tar Heels Shane Simpson (22) being defended by Maryland Terrapins Isaiah Davis-Allen (26) during the quarterfinal game between North Carolina Tar Heels and Maryland Terrapins at Navy Memorial Stadium in Annapolis, MD. The recent college graduate, who’s barely old enough to drink, runs his players hard and emphasizes that they play physically at all times. It’s the only method he knows. Between his mother, father and aunts, he was raised on what he calls “tough love,” so pushing his players to the edge — and maybe raising his voice — is second nature. For that, he’s known as a “tough coach” among the kids and their parents, but that’s all according to plan. “I hold all my players to a high standard, and a lot of them thrive off of that,” Davis-Allen said. But like the coaches who shaped him into the person he is, including his father, Frank Allen, Davis-Allen emphasizes structure in his kids, hoping it influences them on and off the field. “A big part of coaching isn’t just molding people into good players, it’s molding kids into being a good person,” Davis-Allen said. The other reason Davis-Allen, who is black, enjoys giving back to the community is being a visual role model for little boys and girls who look like him. Despite its Native American roots, lacrosse has long been a predominantly white sport. During the 2015-16 NCAA season, just 3 percent of male lacrosse players were African-American (compared with 84 percent white), and Hampton University became the first historically black college to play Division I lacrosse. While MLL’s demographics aren’t publicly available, just one of the top 10 scorers from last season, Chesapeake Bay’s Myles Jones, was black. Of the approximately 20 kids whom Davis-Allen coaches, only three are white. Much like Cullen Jones in swimming, Tiger Woods in golf and P.K. Subban in hockey, Davis-Allen can attest to the benefits of having a black role model in a sport that’s traditionally lacked African-Americans. 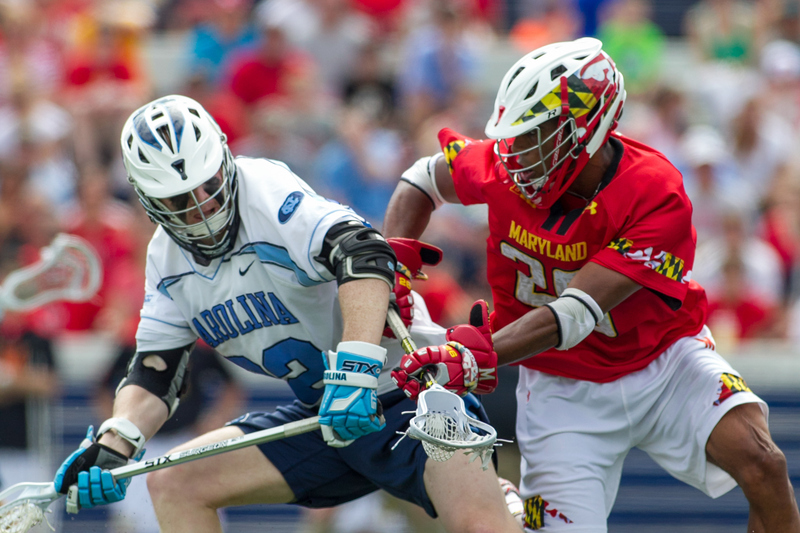 Prominent lacrosse players have included Kyle Harrison, Jovan Miller, Hakeem Lecky and fellow Maryland alum Pat Young. “Watching guys like that play is something that really influenced my play and me wanting to play the sport,” Davis-Allen said. Watching players such as Harrison and Miller, who was an MLL All-Star in 2012, is the reason Davis-Allen is on his way to his fourth championship tournament in as many years. They’re the reason he’s a multi-time all-conference and All-American player and why he’ll join the elite, and rare, club of black professional lacrosse players at the end of the month. And after all this time, Davis-Allen wants to be a Harrison or Miller to a budding crop of young African-Americans.